[Updates below] Reactions & Al-Qaeda tries to take credit for Bhutto’s death. NYT, SkyNews, MSNBC, CNN, ABC, and Washington Post are all reporting that Benazir Bhutto has been assassinated and a deadly suicide bombing attack that has killed at least 20 people. Evidently she was shot in the neck and chest and as she was getting in a car to leave the rally, the initial reports are claiming. Her husband later told media she was in surgery. Pakistan is already in a state of emergency declared by Musharaff earlier in the year and there had already been an assassination attempts on Bhutto at a rally in October and again yesterday, police stopped a would-be bomber with explosives around his neck.. There is also speculation that this assassination might postpone the parliamentary elections scheduled for January. According to ABC, early reports were that Bhutto was safe, but reports have now come out that she is dead. The Washington Post is reporting that at a different rally, a sniper opened fire on supporters of former prime minister Nawaz Sharif, leaving four dead and five injured. Ms. Bhutto, 54, returned to Pakistan to present herself as the answer to the nation’s troubles: a tribune of democracy in a state that has been under military rule for eight years, and the leader of the country’s largest opposition political party, founded by her father, Zulfikar Ali Bhutto, one of Pakistan’s most flamboyant and democratically inclined prime ministers. But her record in power, and the dance of veils she has deftly performed since her return — one moment standing up to General Musharraf, then next seeming to accommodate him, and never quite revealing her actual intentions — has stirred as much distrust as hope among Pakistanis. A graduate of Harvard and Oxford, she brought the backing of Washington and London, where she impresses with her political lineage, her considerable charm and her persona as a female Muslim leader. But with these accomplishments, Ms. Bhutto also brought controversy, and a legacy among Pakistanis as a polarizing figure who during her two turbulent tenures as prime minister, first from 1988 to 1990 and again from 1993 to 1996, often acted imperiously and impulsively. She faced deep questions about her personal probity in public office, which led to corruption cases against her in Switzerland, Spain and Britain, as well as in Pakistan. Daily Mail has pictures of Bhutto right before the attack and many photos of the carnage afterwards. This will do nothing to stabilize Pakistan and will, in fact, destabilize it further as accusations fly and fingers start pointing. In Rawalpindi, right in front of Rawalpindi General Hospital where Late Benazir Bhutto died and her dead body is present right now, workers of People’s Party are sitting and weeping loudly. In other areas of Rawalpindi like Faizabad, Saddar and Murree Road, angry crowd is burning shops and vehicles and shouting slogans against the terorists. On Dusht Road, Peshawar, angry crowd has blocked the main road. All the roads leading to capital Islamabad have been barricaded and blocked and there are reports of collision of police with protesters. More photos can be found at Getty Images. Pakistan is a nuclear power which makes this type of instability a very dangerous situation for the international community as a whole. This also could spark a complete civil war in Pakistan. Photos of the streets on television news shows protests, rioting and they are saying Bush has been informed and more than 40 other people are being reported as injured. These are just initial numbers from multiple reports and I will update as more news comes out. “I am deeply troubled by the news accounts this morning of Pakistani opposition leader and former Prime Minister Benazir Bhutto’s assassination in a suicide attack. This is devastating news for the people of Pakistan, and my prayers go out to them as we follow developments regarding this dire situation. “My deepest condolences go out to the family and supporters of this remarkable woman, an individual who paid the ultimate price for her embrace of moderation and rejection of extremism. 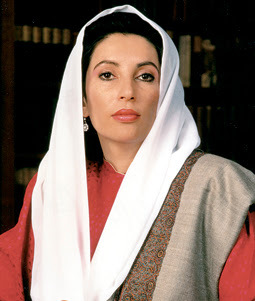 “The death of Benazir Bhutto underscores yet again the grave dangers we face in the world today and particularly in countries like Pakistan, where the forces of moderation are arrayed in a fierce battle against those who embrace violent Islamic extremism. “Given Pakistan’s strategic location, the international terrorist groups that operate from its soil, and its nuclear arsenal, the future of that country has deep implications for the security of the United States and its allies. America must stand on the right side of this ongoing struggle. “Pakistan has long been a key part in the war against extremism and radical jihadists. For those who think Iraq is the sole front in the war on terror, one must look no further than what has happened today. America must show its commitment to stand with all moderate forces across the Islamic world and together face the defining challenge of our generation –- the struggle against violent, radical jihadists. Laura and I extend our deepest condolences to the family of Benazir Bhutto, to her friends, to her supporters. We send our condolences to the families of the others who were killed in today’s violence. And we send our condolences to all the people of Pakistan on this tragic occasion. The United States strongly condemns this cowardly act by murderous extremists who are trying to undermine Pakistan’s democracy. Those who committed this crime must be brought to justice. Mrs. Bhutto served her nation twice as Prime Minister and she knew that her return to Pakistan earlier this year put her life at risk. Yet she refused to allow assassins to dictate the course of her country. We stand with the people of Pakistan in their struggle against the forces of terror and extremism. We urge them to honor Benazir Bhutto’s memory by continuing with the democratic process for which she so bravely gave her life. One has to wonder what this type of tragedy will mean for our own primaries and caucuses coming up, because it does highlight the need for strength on National Security. [Update #2] Hat tip to Hot Air for pointing us toward this article reporting that al-Qaeda is tying to lay claim to Bhutto’s murder.